The type of transportation people use to travel is known as a mode. A ‘mode split’ comprises the total picture of all the different transportation types people use to travel. Tracking and studying a mode split is an essential component in developing sustainable transportation options in our region. The UNC mode split results aid staff to determine the effectiveness of transportation options and incentive programs. * ‘Other’ category includes telework, dropped off, and motorcycle/scooter. The percentage of employees who drive alone to campus increased to 64%, the highest level since 2001 (72%). Park & Ride decreased from 7% to 5%, the lowest percentage recorded, due in part to the introduction of fees to use Park & Ride lots in 2014. Bus ridership remains consistent, likely due to former Park & Ride users who maintained their previous shift to transit in 2015. Reported bus usage decreased from a high of 52% to 39%. Local Chapel Hill Transit and Regional bus usage was separated for the first time in the 2015 Survey. In 2017, Chapel Hill Transit usage decreased from 43% to 35% and Regional Transit decreased from 9% to 4%. Bicycle usage remained at 13%. Park & Ride remained at 6% and walking increased from 5% to 9%. These decreases are likely the result of the significant shifts to transit usage. In order to effectively promote use of modes of transportation other than driving it is important to understand commuter preferences and behaviors and the factors that influence their travel choices. These sections highlight data from the survey that will help develop programs and policies to enhance mobility to campus. Employees provided common reasons why they do not ride the bus or carpool/vanpool more often. The most common reason reported was a personal vehicle was needed for childcare/family responsibilities and errands, followed by an irregular work schedule, and needing a vehicle in case of an emergency. 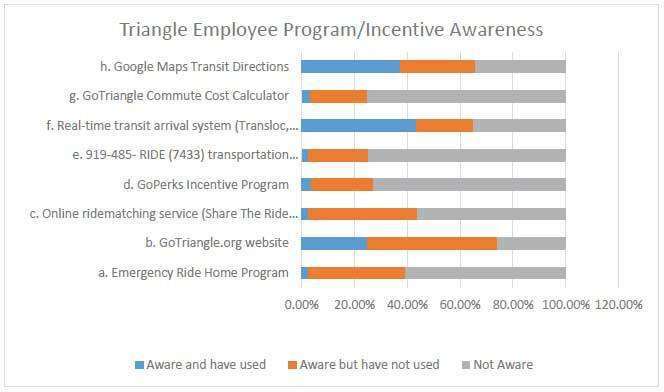 The number of employees who are unaware of Triangle area and UNC emergency ride home programs is over 50% for both and over 40% of those aware have never utilized the service. These results remain unchanged from the 2015 Survey. Students cited irregular schedules, the bus taking too long compared to a car, and the bus running too infrequently near their home. The majority of off-campus student housing is within one-quarter mile of a Chapel Hill Transit bus stop which points to the need for increased frequency to accommodate irregular schedules. Chapel Hill Transit’s North-South Corridor Bus Rapid Transit (BRT) project consists of a BRT system along the Martin Luther King Jr Boulevard/South Columbia Street corridor. A congestion-free bus option may alleviate these concerns by providing fast, frequent, reliable service to campus. Survey respondents were asked what services or benefits would make them consider using a mode of transportation other than their personal vehicle. Consistent with the 2015 Survey, both employees and students cited more frequent and faster bus service would make them reconsider driving to campus. The difference between the 2015 and 2017 results are the far greater number respondents highlighting faster and more frequent transit service. Those citing improvements in these areas would influence them a great deal increased from just under 40% in 2015 to 60% in 2017. Employees and students who drive alone and live less than five miles from campus are at 26% and 74%, which is consistent with past surveys. Respondents living less than five miles from campus place the survey respondents within the Chapel Hill-Carrboro area and a number of different transportation options. The number of employees living within five miles increased slightly to 36% from 2015’s 34%. 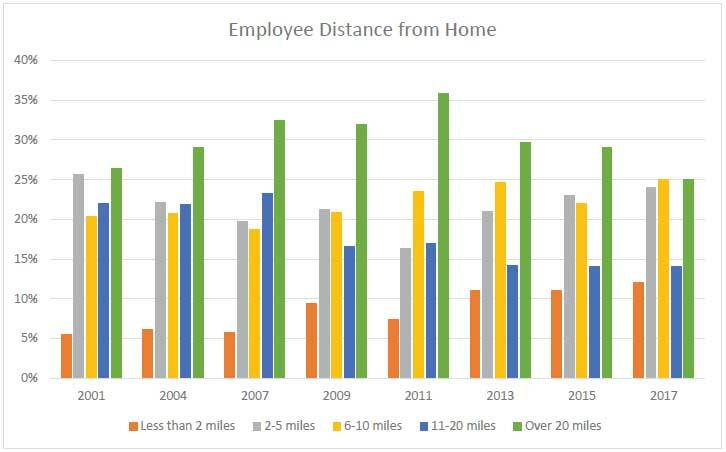 Those living over 20 miles away decreased in 2017 to 25% from 2015’s 29%. Employees residing less than two miles up to 10 miles all increased compared the 2015 survey. 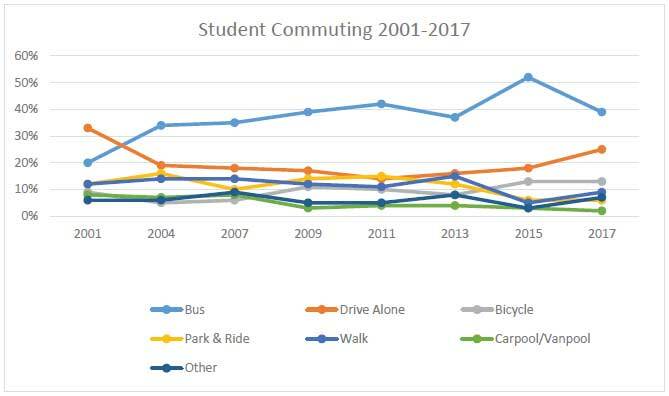 Despite residing closer to campus and have a higher number of transportation options, people still chose to drive alone to campus. Consistently low gas prices and the use of free or private parking arrangements may explain this increase. 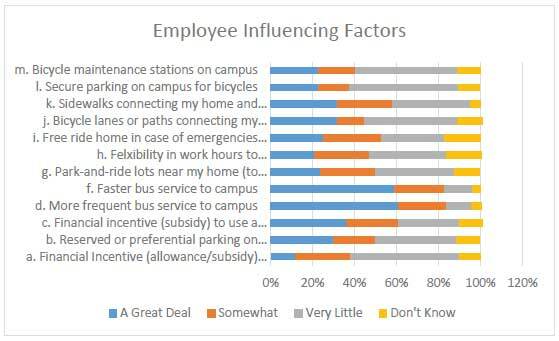 The top four reasons employees living less than five miles from campus gave for not bicycling more to campus include: Too far to bike, the roads to campus are unsafe, lack of bike lanes or paths on route, and there is no place to shower at work. Students indicated that it is too far to bike, the route to campus is too hilly/biking is too difficult, roads to campus are unsafe, and there is a lack of bike lanes/separated paths on their route. Dedicating more transportation funding to bicycle improvements may alleviate concerns about unsafe road conditions by separating people from high speed motor vehicle traffic. The increased affordability and usage of electric assist bicycles may alleviate those who think cycling is too difficult. Twenty percent of employees who stop on the way to work do so to drop off and pick up children. Increasing the connectivity and safety of cycling infrastructure coupled with flexible schedules may facilitate those parents to ride with or take their children to school by bicycle. 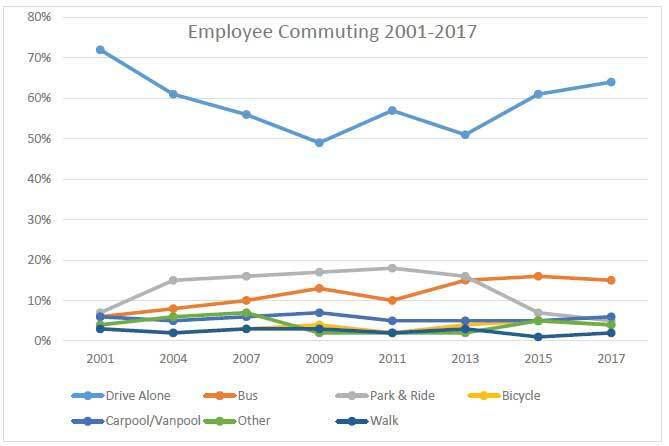 The shift in employees driving alone and decrease in those who used Park & Ride continued compared to the 2015 Survey. The three most popular Park & Ride lots remain the Friday Center, Southern Village, and Southpoint Mall.